The European country, Denmark has produced some fine football stars and Kasper Schmeichel is one of them. He played for three age groups for his national team before joining the senior team in 2013. Kasper won his first major football trophy – the premier league title with Leicester City in the 2015/2016 season. His career has since been on the rise. For two consecutive years in 2016 and 2017, he was the recipient of the Danish Football Player of the Year. Read on as we discuss the highlights of the Danish footballer’s career and personal life. 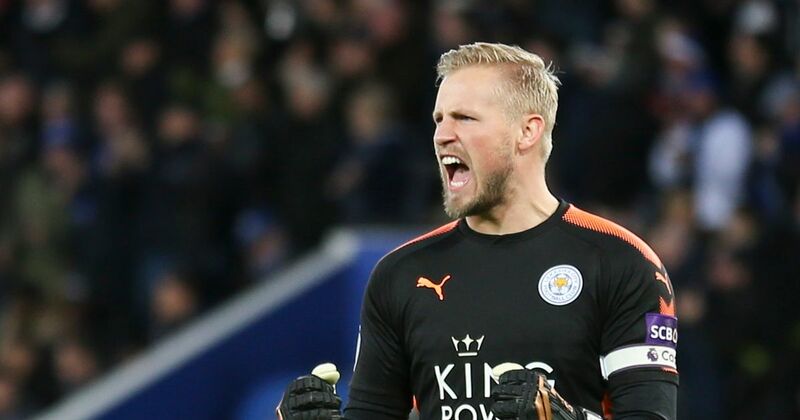 Kasper Peter Schmeichel was born on 5th November 1986 in Copenhagen, Denmark, to former Denmark international and Manchester United goalkeeper Peter Schmeichel and Bente Schmeichel. Thus, Kasper is a second generation footballer. Owing to his father’s football career which brought him to England, Kasper spent a greater part of his childhood in England which explains his accent. During the period when his father played for Manchester United, Kasper attended Hulme Hall Grammar School in Greater Manchester. And, when his father played for Lisbon’s Sporting CP, Kasper schooled at Saint Julian’s School in Portugal. Following in his father’s footsteps, Kasper picked up an interest in football at a very young age. He began his youth career with Portuguese club side Estoril and two years later, he joined Manchester United youth team on a long-term contract. Kasper made it to United’s senior team in 2005 after which he had numerous loan spells at smaller clubs to improve his performance. Some of the clubs he served on loan include Darlington, Cardiff City, and Coventry City. By 2009, Kasper’s improvement was impressive enough to get Notts County sign him in a club record transfer fee that saw him earn an annual salary of ₤1 million making him the club’s highest-paid player. Thanks in part to his clean sheets, the club won the 2009/2010 League Two trophy and were promoted to League One. As a result of conflicts on his contract, Kasper left Notts in 2010 to join Leeds United on a two-year contract. However, he spent just one season at the club before Leicester City came calling for his services in June 2011. Kasper is married to a certain Danish woman named Stine Gyldenbrand. They first met in 2004 when Kasper was 17 years old. On the day that they met, Stine had just become a student. In her interview with Danish online magazine ALT, she revealed that her first date with Kasper was pure fireworks. Stine graduated in 2009 from the University of Chester with a degree in midwifery. Post-graduation, she began working in a hospital near Birmingham. After 11 years of being together and having two kids Max (born in 2010) and Isabella (born in 2012), Kasper and Stine got married in June 2015. Stine was reportedly 20 minutes late to their big day which was held at Egebæksvang Church. One of the highlights of their big day was the creative espalier formed by their bridesmaids and groomsmen. The ladies held up wooden stethoscopes signifying Stine medical profession while the guys held up footballs, as the couple walked under after exchanging vows at the altar. Danish singer and songwriter, Erann David Drori better known as Erann DD entertained guest at the event. 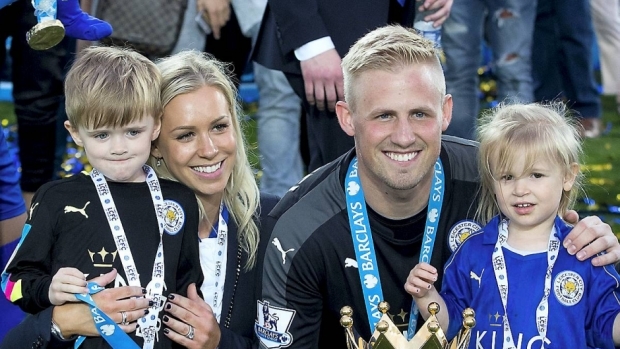 Kasper and his wife run a charity organization called Gyldenbrand Schmeichel Foundation. It is aimed at helping to curb maternal mortality in Africa. Additionally, Kasper’s wife has also teamed up with fellow Danish footballer, William Kvist’s wife Christine Vitved Kvist to found the Football Association Foundation. The couple hopes that their dedication to charitable causes would inspire their children to do same when they are of age. 1. Kasper Schmeichel was schoolmates with Alex Bruce whose father played with Kasper’s father in Manchester United. Like their parents, Kasper and Alex would later become teammates during their spell at Leeds United. 2. Kasper is an Ambassador of Precision Goalkeeping. 3. He has won two major trophies with Leicester including the 2013/2014 Football League Championship and the club’s first ever Premier League trophy in 2015/2016. Also Read: Jamie Vardy Wife (Rebekah Vardy), Age, Height, Does He Have a Girlfriend? The height and weight measurements of a goalkeeper greatly influence his performance. The taller the height, the wider his range would be and, the lighter the weight, the easier he’d be able to make flights. Weight – 14 st (89 kg).